We’d love your help. 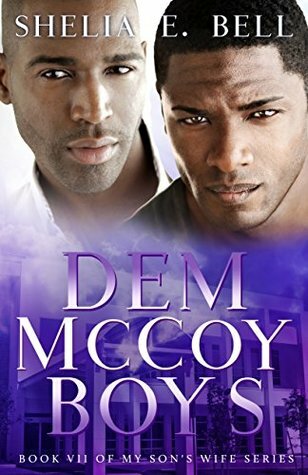 Let us know what’s wrong with this preview of Dem McCoy Boys by Shelia E. Bell. To ask other readers questions about Dem McCoy Boys, please sign up. When I thought it could not get any better. Boom it does. In this book we have Fancy and Hezekiah son as the main characters and boy are they something else. But don't thinn6 its just about Dem McCoy boys all of Hezekiahs skeletons are falling out the closet. This book was great and I can't wait for the next one. Will the torture given by Hezekiah ever end? Fancy has been through too much. Stiles is still running back and forth from Houston to Memphis. He can’t commit to anyone since his heart is still recovering. Khalil is planning to take his dad down. Can’t wait to read how it all unfolds. Is what this read is! Still full of twists and turns, each character portraying their development after each book. I see both Xavier and Khalil’s personalities being revealed at every turn! It’s time for the ride to descend. On the the next book! Wow Hezekiah McCoy has a stroke, goes to a rehab facility and still causes havoc in people lives. And what’s worse is that Detria hasn’t gotten any better either. When are these two people, along with George going to get their just due? Dem McCoy boys was a really good book. I just love how the boys looked out for their mother. This book is full of drama. In this novel it shows that everyone has issues even the pastor. I am looking forward to the next book in this series. This series just keeps getting better and better! Dem McCoy Boys did not disappoint. Could not put the book the book down. Can't wait for the next book. Thank you Ms Bell excellent writing!! This book was everything. A page turner. A must read. I can’t wait to read the next book. Thanks for another great book.